The Indian muntjac or more commonly known as Barking deer, named after the call it makes which sounds like a dog's bark, is a small and delicate looking deer. It has a very prominent facial feature which is the bony ridges of its antlers that extend down their forehead and onto the face. These bony ridges are sometimes longer than its antlers which grow to only about 15cm in length. The Barking deer does not use these antlers as a weapon. Instead, it uses its long canine teeth which grow outward over the lip in a distinct curve. They are fiercely territorial creatures and use secretions from the pre-orbital eye glands to mark their boundaries. 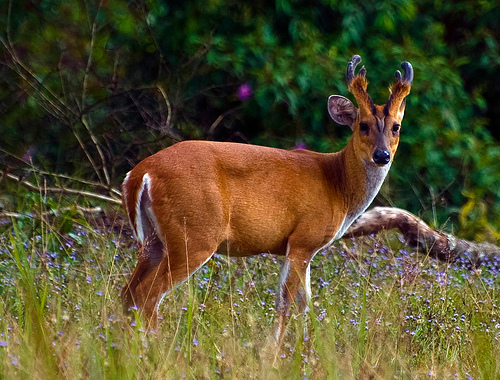 The population of the Barking deer is also widely spread with large distributions throughout tropical Asia. They prefer areas of tropical rainforests where they can hide from man and predators in the dense undergrowth.